This is the last article in a four part series on Resolutionizing your Finances. Visit Other Better Living Network sites focusing on other areas of your life. Part 1 is about budgeting, Part 2 tackles savings and Part 3 discusses insurance. Estate planning is one of those topics people don’t typically like to hear or read about. It’s a reminder that life has an end. Despite the discomfort it’s a necessary step if you want a say in how your assets are handled after death as well as end-of-life decisions. 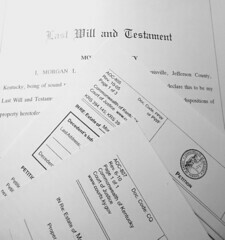 Documents included in estate planning are a will or trust, power of attorney and a living will or health care proxy. There’s more to the process than creating the paperwork with decisions to be made beforehand. The end result should be directions for the executor for all assets. This should include insurance policies, bank and investment accounts, retirement savings, stocks, real estate, and business interests. Also make a list of any liabilities so your heirs know who needs to be paid before distributing the remainder. There are three big questions you must be prepared to answer before preparing any documents. 1. Who do I want to receive my/our assets? 2. Who should make health care decisions for me? 3. Who should handle my finances if I’m unable? A couple of other important decisions remain. If you have young children, there is also the question of who to designate as guardians. Lastly, who do you want to serve as executor? This decision has caused problems in my family because one child (out of several) was selected without informing the rest. More and more people are preparing living trusts instead of wills. The advantage is that it eliminates probate court along with the cost and delay of that method. Trusts require that you transfer ownership of the assets to the trust. Any assets outside the trust should be directed via a will. We have decided to delay creating a trust until retirement as we’ll be selling and buying property before then and don’t want to spend time or money on moving assets in and out of the trust. Ideally, we will all live to 100 plus without mental decline and die in our sleep. Unfortunately, that’s not the reality for most and you need to plan for the worst. A living will or health care directive are your instructions detailing what medical actions should be taken if you can’t make the decisions and who should make them. I’ve written about the importance of living wills before and the heartbreak it caused. It’s easy to not let this happen to your family by documenting your wishes. I still remember the last time I spoke with my grandfather years ago. He wasn’t concerned about dying or what would happen to his possessions because it was already handled. I want that peace of mind. Don’t you? The much overlooked issue in your list is dealing with disability. If you die without a will, the state has rules about who gets your stuff. But if you become unable to sign a check, decide which bills to pay, or sell assets to pay for stuff you need, the problem is much more vexing. The state has strict rules about when and under what circumstances an individual can be ousted from control of their money. Everyone should either have a revocable trust, to which they have actually transferred their substantial assets, or a durable power of attorney which remains effective after the principal loses competence. Everyone, no matter how old you are, should answer those questions. I would add where and how you want to be taken care of after you die. Cremation or burial? Great article! I just want to emphasize that people should not rely on DIY Living Trusts and Wills if they want it done right. Instead, hire an experienced attorney and get it done right so that your loved ones don’t suffer later.